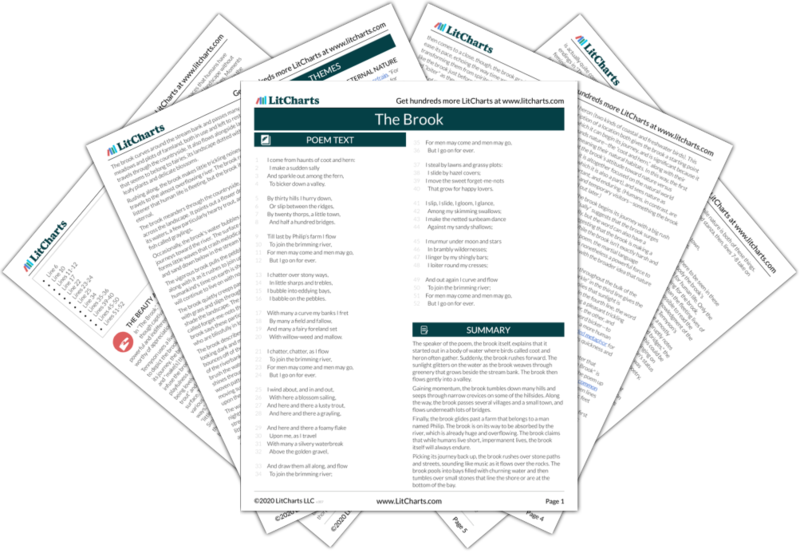 Instant downloads of all 945 LitChart PDFs (including The Brook). British poet Alfred, Lord Tennyson penned “The Brook” in 1886, just six years before his death. The poem is a ballad in which the speaker—the brook, or stream, itself—undertakes a long and winding journey across the countryside to join up with a large river. Tucked inside this seemingly sweet poem about a little stream are darker, more poignant themes of death, human impermanence, and nature's indifference to humankind, though the poem also emphasizes nature's sheer beauty. The poem’s most notable characteristic is its refrain, “For men may come and men may go, / But I go on for ever,” which appears four times throughout the poem and captures both the fleetingness of human life and the constancy of nature. 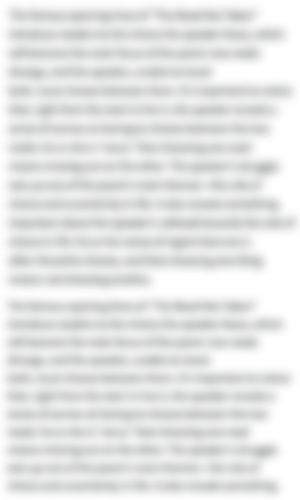 You can read the full text of “The Brook” here. Get the entire guide to “The Brook” as a printable PDF. Download it! 4 To bicker down a valley. 8 And half a hundred bridges. 12 But I go on for ever. 16 I babble on the pebbles. 20 With willow-weed and mallow. 24 But I go on for ever. 36 But I go on for ever. 40 That grow for happy lovers. 52 But I go on for ever. Unlock all 603 words of this analysis of Lines 1-4 of “The Brook,” and get the Line-by-Line Analysis for every poem we cover. Unlock all 708 words of this analysis of Lines 5-8 of “The Brook,” and get the Line-by-Line Analysis for every poem we cover. Unlock all 370 words of this analysis of Lines 9-12 of “The Brook,” and get the Line-by-Line Analysis for every poem we cover. Unlock all 377 words of this analysis of Lines 13-16 of “The Brook,” and get the Line-by-Line Analysis for every poem we cover. Unlock all 330 words of this analysis of Lines 17-20 of “The Brook,” and get the Line-by-Line Analysis for every poem we cover. Unlock all 296 words of this analysis of Lines 21-24 of “The Brook,” and get the Line-by-Line Analysis for every poem we cover. Unlock all 302 words of this analysis of Lines 25-28 of “The Brook,” and get the Line-by-Line Analysis for every poem we cover. Unlock all 271 words of this analysis of Lines 29-32 of “The Brook,” and get the Line-by-Line Analysis for every poem we cover. Unlock all 324 words of this analysis of Lines 33-36 of “The Brook,” and get the Line-by-Line Analysis for every poem we cover. Unlock all 526 words of this analysis of Lines 37-40 of “The Brook,” and get the Line-by-Line Analysis for every poem we cover. Unlock all 356 words of this analysis of Lines 41-44 of “The Brook,” and get the Line-by-Line Analysis for every poem we cover. Unlock all 221 words of this analysis of Lines 45-48 of “The Brook,” and get the Line-by-Line Analysis for every poem we cover. Unlock all 475 words of this analysis of Lines 49-52 of “The Brook,” and get the Line-by-Line Analysis for every poem we cover. Unlock all 259 words of this analysis of extended metaphor in “The Brook,” and get the poetic device analyses for every poem we cover. Unlock all 241 words of this analysis of personification in “The Brook,” and get the poetic device analyses for every poem we cover. Unlock all 481 words of this analysis of repetition in “The Brook,” and get the poetic device analyses for every poem we cover. Unlock all 188 words of this analysis of alliteration in “The Brook,” and get the poetic device analyses for every poem we cover. Unlock all 151 words of this analysis of imagery in “The Brook,” and get the poetic device analyses for every poem we cover. Unlock all 280 words of this analysis of end-stopped line in “The Brook,” and get the poetic device analyses for every poem we cover. Unlock all 249 words of this analysis of enjambment in “The Brook,” and get the poetic device analyses for every poem we cover. Unlock all 269 words of this analysis of allusion in “The Brook,” and get the poetic device analyses for every poem we cover. Unlock all 267 words of this analysis of onomatopoeia in “The Brook,” and get the poetic device analyses for every poem we cover. "The Brook" Put to Music — Enjoy this archived copy of vintage sheet music—or even play along! 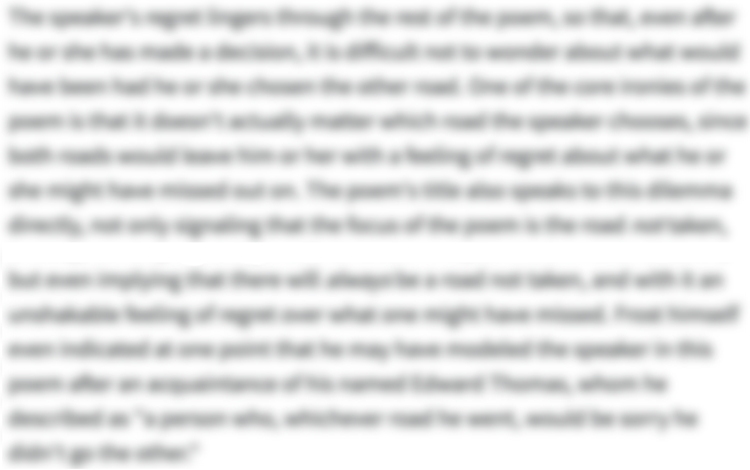 More Background — Read more about Tennyson's private and public life. "The Brook" Read Aloud — Listen to a reading of Tennyson's "The Brook." Tennyson's Life — Read about how Tennyson's personal life shaped his work. Weeks, Rachel. "The Brook." LitCharts. LitCharts LLC, 21 Dec 2018. Web. 17 Apr 2019. Weeks, Rachel. "The Brook." LitCharts LLC, December 21, 2018. Retrieved April 17, 2019. https://www.litcharts.com/poetry/alfred-lord-tennyson/alfred-lord-tennyson-the-brook.